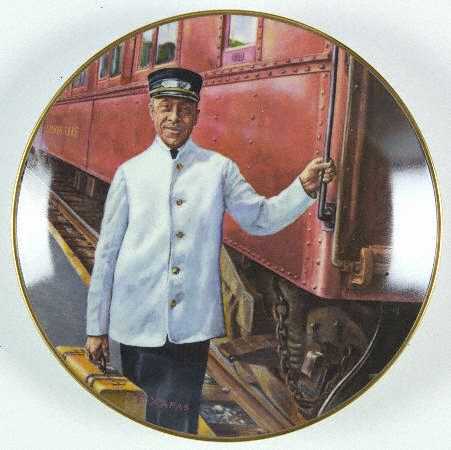 From the New York Times on July 25, 2004, "'Rising From the Rails': Up From the Sleeper Car," by A'Lelia Bundles -- FOR just over a century, until 1969, Pullman porters were as much a part of luxury American train travel as grand marble-columned terminals. More than just the amiable public face of the Pullman Company, the porters -- recently freed slaves -- were crucial to its early success in the decade immediately after the Civil War. As the company's founder, George Pullman, quickly realized, a post-midnight hot toddy and a freshly whisked topcoat were more essential to customer satisfaction (and long-term profits) than the damask curtains and wood-paneled chambers of his ''hotel on wheels.'' And who better to help him maintain his near monopoly of the lucrative sleeping-car industry than the carefully screened black servants whose gentlemanly, nonthreatening demeanor aimed to reassure the wealthy white travelers of the late 19th century? ''The old Southern colored man makes the best porter,'' a Pullman general manager said nostalgically in 1915, as the first generation of porters (and the last generation of former slaves) was beginning to die. By its very nature, the work of a Pullman porter could be demeaning, infused as it was with the plantation mentality that lingered in America well into the 20th century. But at a time when even college-educated black men might wind up doing menial labor, the porter's job provided the kind of vicarious exposure and connection to powerful people that Larry Tye contends ''helped shape today's black middle class and intelligentsia.'' In ''Rising From the Rails,'' Tye makes the even bolder claim that ''behind almost every successful African-American, there is a Pullman porter.'' It is a provocative assertion, one that Tye earnestly sets about to prove. By the 1900's, when 100,000 passengers a night lay tucked into its sleeping berths, the Pullman Company was the largest single employer of black men in the United States. The same men who were portrayed as grinning, bowing valets in film and fiction were revered at home as dignified, well-traveled sophisticates. ''His was the best job in his community and the worst on the train,'' Tye observes. Tailored jackets and spit-shined shoes guaranteed status in segregated neighborhoods where dusty overalls and mud-crusted brogans were the more frequent attire for workingmen. That more than a third of Pullman porters owned their own homes in 1926 only boosted their reputations as community leaders whose middle-class aspirations trumped their blue-collar realities. It is no surprise that they ''were thought to be catches as husbands,'' as Tye writes. Scores of former Pullman porters and dining car waiters excelled: Benjamin Mays, a Phi Beta Kappa graduate of Bates College, who became president of Morehouse College; the explorer Matthew Henson, who helped discover the North Pole; and J. A. Rogers, whose 1917 novel, ''From 'Superman' to Man,'' remains one of the most authentic accounts of a Pullman porter's experiences. But the porter's ''most lasting legacy was his children and grandchildren, and all that they accomplished educationally and economically, socially and politically,'' Tye contends. Clearly that is true of William Kennard, a former chairman of the Federal Communications Commission and now a managing director of the globally powerful Carlyle Group, who inherited his confident manner from his Pullman porter grandfather. It is equally true of the Supreme Court justice Thurgood Marshall, the former San Francisco mayor Willie Brown and the Olympian Wilma Rudolph, who all benefited from the lessons of Pullman porter fathers. Terry Gross interviews Journalist Larry Tye, they examine the social history of the porter in Rising from the Rails: Pullman Porters and the Making of the Black Middle Class. Tye says that the job was one of the best for African Americans at the time, and that it was a foothold in the American workplace. Tye reports for The Boston Globe. Click here to view author Larry Tye discuss his book on C-Span2.